The recent announcement by the Keep project team provides a timely opportunity to give an update on a long term conservation project, destined for display in the Castle Keep. 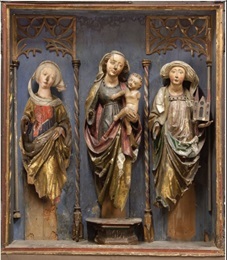 After extensive paint analysis, research and consideration, this 16th century Southern German polychrome church altarpiece has been undergoing transformative conservation treatment. This has involved the removal of disfiguring, mostly Victorian over-paint, to reveal the original medieval paint layer underneath. Paint analyisis confirmed that the altarpiece figures had undergone numerous campaigns of overpainting and varnish, which meant that the process of removing these layers, whilst ensuring no damage was caused to the medieval layer, was a complex and delicate task. The process required the use of a combination of solvent gels, cotton wool swabs and scaplels. Removing specific paint layers with a scaplel is a painstaking task and requires being conducted under high magnification. The results have been quite dramatic. 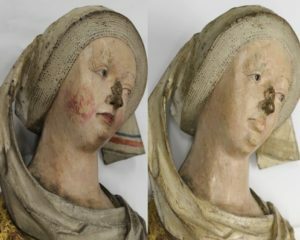 Once the thick and dirty over paint was removed, the face of the ‘Dexter’ figure, pictured here, was revealed to have smooth, almost porcelain like skin, characteristic of a late medieval aesthetic ideal. 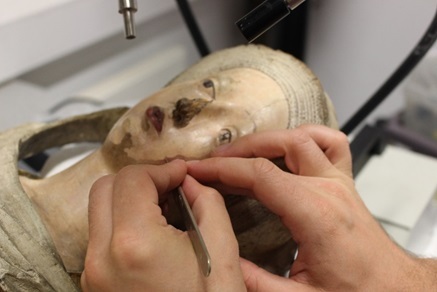 The treatment of the altarpiece is an ongoing project which aims not only to reveal the medieval paint layers, but to stabilize and conserve the object as a whole. Securing and relaying paint flakes, consolidating pest and water damaged wood and designing a safe way to display the altarpiece, are all crucial to the process.